Retro Cafe Art Steampunk Manikin and a PRIZE! This was a whole lotta fun. Steampunk, paper, paint, and metal! These Manikins from Retro Art Cafe are so easy to work with. You've got to check them out. You decorate them with paper, paint, stamps, etc, etc, etc.....and then put them together with brads and/or eyelets. Both were copper here. 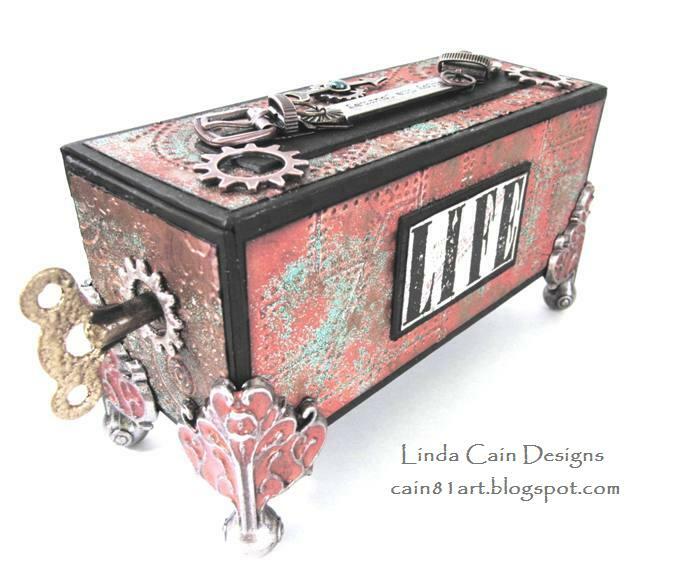 I used some Masonite Gears from RCA, painted them with the Distress Paint Metallics, and then stamped. The Brass Steampunk Pendant took the Distress Paints really well! Then I added the Clock Key to the middle. Can't decide which direction I like it best!!! I LOVE the helmet. It's a Door Pull from Graphic 45!!! TOO COOL! The Vintage Pocket Watch Key hangs from the helmet with some copper wire as well as a Gear. A tiny lightbulb on top of his helmet is perfect!!!! The goggles and little brass colored dials are old computer parts from a friend. 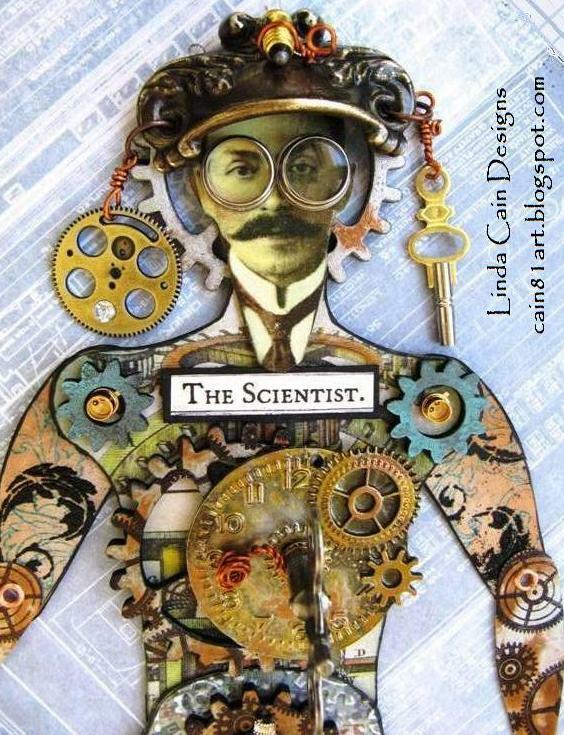 The man's head and The Scientist are from the Time Traveler Collage Sheet. You'll love this sheet!!! 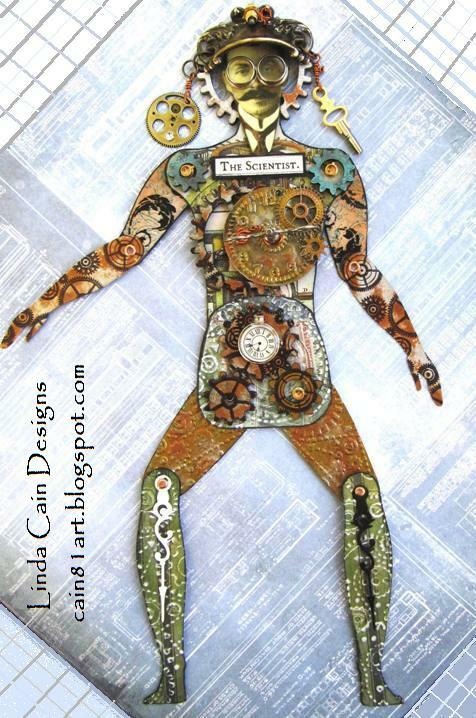 I used the Gears Texture Fade to emboss the 8x8 Collage Stash papers and added more ink and paint. Some pieces were sanded, some just had markers added for color. Upper arm parts are stamped with black Archival Ink. Some parts are embossed with Super Fine Black Embossing powder. I used the PaperArtsy - Ink and the Dog Mini 60 to stamp the small gears here and there. The metal Watch Hands were added to the legs with a brad. Check out all the COOL stuff you can get at Retro Cafe Art by following the links below! Now through Monday May 27th, take 10% off EVERYTHING at Retro Café Art Gallery. Simply use Discount coupon code: MD10 at check-out. AND, Kristin with Retro Cafe Art has graciously donated a $25 gift certificate to be given away in a random drawing from comments left here. Drawing on JUNE 3RD. So you've got 2 chances to win great prizes on my recent blog posts. I got an email from Tim inviting me to play along in the Melt Art Mania with Ranger. We could use UTEE, or Bees Wax, embossing powder, shrink plastic...whatever. I pondered, thinking I wanted something "different" that wouldn't be a lot like everyone elses....maybe. And so I decided to make.....EARRINGS! And I did, but then, then I had an Epiphany again. 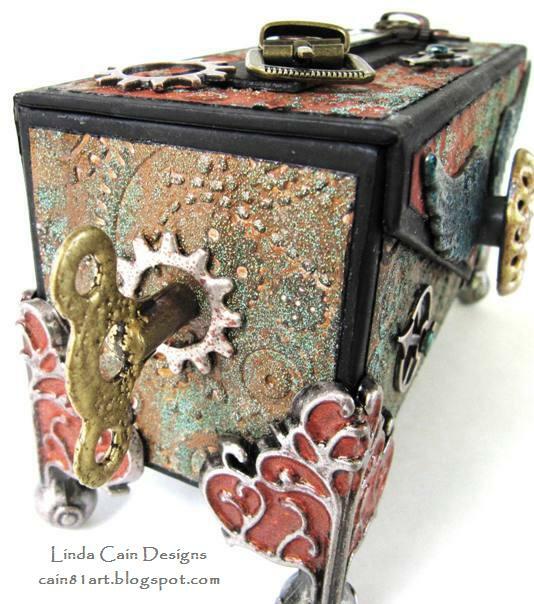 GEARS and the BUCKLES on a box with the FOUNDATIONS embossed!!! So, you get 2 for the price of one today......and a chance at a PRIZE package! 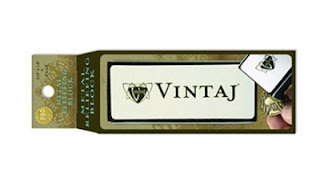 This is actually an Eyeglass case. I took some paper from the 8x8 Collage pad and ran it through the Vagabond with the Gears Texture Fade to emboss, then added Clear Embossing Ink to the raised areas in spots, added Verdigris Embossing Powder and heated it up. 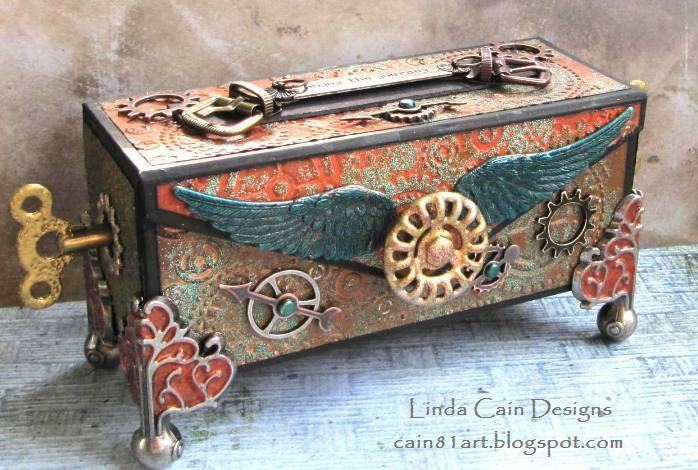 Add Distress Inks and Antique Bronze Distress Paint for some contrast. On the ends you see the Clock Key and a Gear with various UTEE (Ultra Thick Embossing Powders) on them. I LOVE the way the Keys look pitted and old. Just push the flat side of the key, gear or the face of the knob into the Clear Embossing Ink pad and then dip it into the UTEE jar. Remove carefully and heat it up. I did use Tiger Lily on the Foundations, a color that's been discontinued, but many of you may still have the Brightz colors from Suze. Push them into the ink and use a cloth to wipe the raised area clean. Then sprinkle the UTEE into the area to be embossed. Heat with Heat it Tool. REMEMBER - Metal gets HOT when you heat it up, let it sit to cool before touching it!!! The end papers have the Verdigris powder, brown Distress Inks and Antique Bronze Distress Paint. Here I used Stream Alcohol Ink on the wings (Regal Adornments are on sale!) and embossed with Clear Embossing Powder. You can see I polished the Spinner and Gear here with the Reliefing Block (see later in post). The Front Flap has Ripe Persimmon Distress Ink, Verdigris powder, and some Brown Distress Inks. I used the Worn Text set to stamp LIFE onto a paper from the 8x8 Collage Paper Stash collection, and embossed with Super Fine Black Embossing powder. This side has the Riveted Metal Texture Fade with Ink, Paint, and Embossing Powder. I layered the LIFE onto black chipboard for the back of the box. Now I LOVE this top piece with the Mini Gear, a Spinner, Buckles, Word Band and Ring Fasteners!!! The embossed Gears on the papers really show up great for the background. This Faucet Knob has Gold, Platinum and Bronze UTEE on it! These colors all work great on metal! You lift the flap using the Faucet Knob to open the lid of the box. So there's the 1st project, "LIFE - enjoy the journey"and now for the Earrings!!! 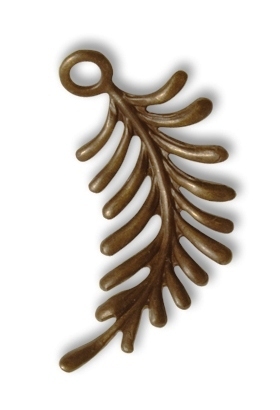 Yep, these pieces that look like enameled brass are actually very easy and reasonable to make. 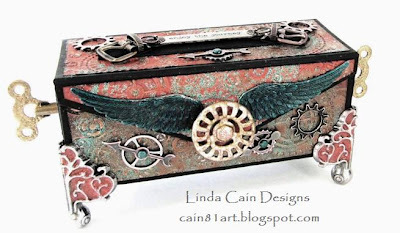 I used 2 pieces of Brass Vintaj metal to make these, PLUS embossing powders. This is a daylight/Ott light picture. Some of the others taken in progress are at night...you know how I am. First I ran the 25guage natural brass blank Guitar Pick, through the Vagabond Machine using the a DecoEmboss folder Deco Motif. This is so easy it's almost sinful! Then I polished it with the Metal Reliefing Block. This tool is A-Ma-Zing! Worth every penny when it comes to polishing brass or other metals. 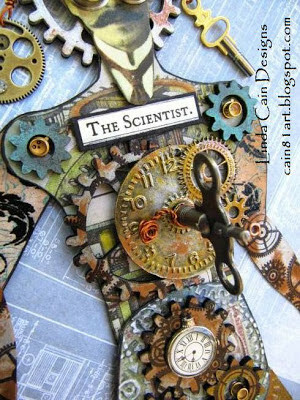 I use it on my Idea-ology Keyholes, Gears, and Keys as well to brighten up the piece. So you can see the difference this makes on the embossed blank! It polishes the top and leaves the recessed area dark. Gorgeous! This tool is for jewelry generally, so it's much finer than a sanding block, and it has a side that just polishes. 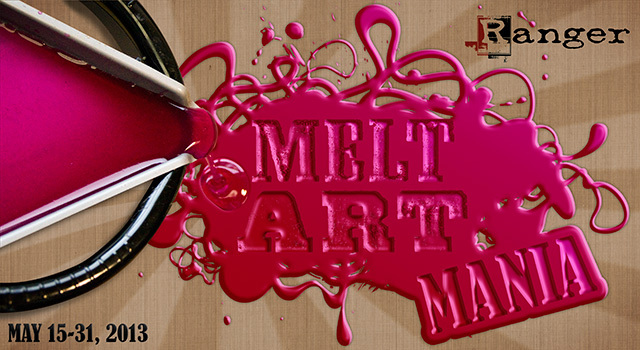 OK, now to the "Melt Art" part. I pushed the blank face down into the clear embossing ink pad. Got it real juicy, and then used a soft rag to "gently" wipe the ink off the raised area of the blank. I used my shirt tail! Hey, it's old and it's cotton! I should use that info just to see if anyone read this whole tutorial as a test to win. Then use your Heat It Tool to melt the embossing powder. You can also lay this piece in the Melting Pot on a Craft Sheet to melt the powder. Either way. Polish it again with the Refining Tool, and it's pretty impressive! Melts right into the recessed areas. I decided they were pretty, but they needed some contrast to show up better. So I tried the Fern Curving Right...to me it looks Left, but what do I know? These are a couple of the things I embossed. The top charms are with Verdigris and Gold UTEE. Heat it up and while it's still hot, lightly sprinkle more colors on top of your base color to melt in. DO NOT OVERHEAT! It will all blend in together and become one color if you do that. The Ferns are with Verdigris, Tiger Lilly, and Gold UTEE. I made the final set with just Verdigris and Tiger Lily...no Gold. The Tiger Lily shows up COMPLETELY different on the Brass than it did on the Silver Foundations. Darker. I used Tiger Lily UTEE that I had on hand, but you can use clear and mix with Coral Heat It Inks in the Organic Set to get an orangy color. Add 2 gold-plated ear hooks and some jump rings and they're "out the door" DONE! 2 texture treads, 1 set of heat-it inks, an 8oz. jar of clear UTEE, and a Melt Art Project Craft Sheet. We'll have a random-generated drawing and Ranger will send out your box of Goodies! Leave a comment, and make sure I know how to contact you if you win, or just check back when we have the drawing on June 1st. Ranger Melt Art coming here tomorrow!!!! Can anyone say MELT ART MANIA PRIZE????? 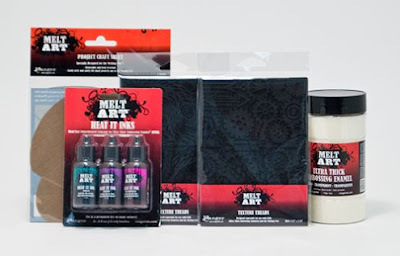 Well, tomorrow I'll show you not ONE, but TWO ways to play with the Melt Art Products from Ranger. So get ready to have some fun, and leave a comment here tomorrow for your chance to win a prize. This is what's in the Prize Package.... from Ranger. I am having WAY too much fun! This is a #7 tag I had on my desk when I'd finish a project sometime back. I took the pieces of Cut n Dry foam that had Fresco Paints in them and pounced them all over this tag. They were light in some areas, but the tag was covered. Then I got my new shipment of Lynne Perrella Stamps Collection 01 from PaperArtsy and some Grunge Paste. Well, you know what THAT means!!!! This is the tag with just the leftover paints and the Grunge Paste stenciling. VERY cool stuff! Love it, and it dries really fast! I used Jet Black Archival Ink and stamped the images from just one collection. I think they really turned out cool with the different looks on the white Grunge Paste and the Fresco Paints. The last stamping was the small seashell done with Coffee Archival Ink. The little Olive Archival Ink splots are with Ink and the Dog Mini 72. I added a few highlights with TomBow Pens to give it a bit more color. Layer it onto black Chipboard and add a glittery gold ribbon bow. This book was probably more fun than I've had in a long time. I just laid it out and went with it! Sometimes that produces our best work, in any field. Don't think, just do! Anyway, I love it. It has 2 of my favorite color combinations with lots of black to make the colors pop! I tried adding lots of ribbons, and charms, but in the end, I went with a simple turquoise piece of seam binding and a locket key with a chain tassel on a swivel clasp. This is the front inside cover with some stamps from the talented Lynne Perrella and Anna Dabrowska. Here is a detail of the front. Lots of paint, glue, sprays, and ephemera. The inside back cover has the Sunrise Sunset papers that have GORGEOUS colors! UPDATE: I used the Zutter Bind-It-All and Owires to put this book together. The front and back come in a flat pack so they're easy to paint and decorate. Then you punch the holes for the wires and add your pages all on the little machine. I've had mine for a long time and forget to use it. I works great when you want to get color right up to the edges and still have a wire binding. Hope you enjoy. Check out the links for products ....and Create ART! Tim Holtz - Remnant Rubs Numbers, Keyholes, Game Spinner, Locket Key, Chain Tassel, Swivel Clasp. Metal ephemera - Vintaj Key, Metal Dots. I love playing with Fresco Paints from PaperArtsy, and Coffee Break Designs from Retro Cafe Art! So you can imagine that I really enjoyed making this cute wall hanging that could house any number of pictures or treasures. If you've been here before, you know how these kits come flat, you paint them and then glue together. I made this in one afternoon...seriously..painted it, stenciled the stars on, stamped the inside of the cubbyhole, and glued it together. I hung charms and beads from the pre-drilled holes, but they can also be ordered without the holes. So cool. It's always hard to get a picture inside the pieces, so I took this on my worktable before I glued it into the Moon. The inside has stamps from PaperArtsy - Ink and the Dog Minis, two of my all-time favorites, and of course, the wonderful blending paints from Fresco. If you ever try these paints, you'll be spoiled forever. See how they glow??? The Haystack, with Smoked Paprika on the edges and some Brown Shed, are so warm. The Moon is really the Turquoisey color here. Blues never look right when I photograph them..in daylight, Ott Light, or whatever. Nothing shows the beauty that is really here. The Blues are Bora Bora as a base, with Beach Hut, South Pacific, and Inky Pool on the edges blended in. Retro Cafe Art - Coffee Break Designs - Moon Shrine Kit, Star Mix Cutouts. Retro Cafe Art - Stencils - Night Sky Star Set Stencils. Paper Artsy - Fresco Paints - Snowflake, Bora Bora, South Pacific, Beach Hut, Inky Pool, Haystack, Smoked Paprika, Brown Shed. Paper Artsy - Ink and the Dog Stamps - Mini 74 Script, and Mini 22 Numbers. I LOVE everything Anna Dabrowska does. I had to have some pieces in her new line with Prima Marketing called Sunrise Sunset. This project showcases these new products. I worked with 2 tags as I went along, and will choose one later to use in the final piece. 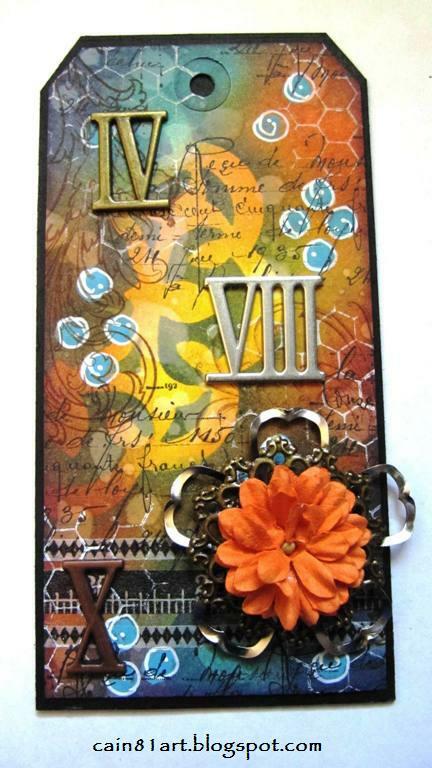 Using a #8 Manila Tag I started adding Mustard Seed Distress Ink with the Blending Tool to the center area of the tag. Try to keep at least some of this pure as you go along adding color so you have a bright area in the middle. Then add Spiced Marmalade, Wild Honey and Ripe Persimmon in layers to create a rich orange color blended at the edges of the yellow. Next I took a piece of acetate and my Bigz Die Ornate Plate from Karen Burniston and ran it through the Vagabond creating a Mask. Lay the Mask over the tag in the upper left corner and use Chipped Sapphire to add color. Move it down to the lower right corner and add it again. Now, the next layer is water. Spritz water into your palm several times, you want big drops. Then drop or flick them onto your tag. Add more if needed. Let them sit for a few seconds and then blot them with a paper towel. Using the Elements Tissue Tapes, I chose 2 to add to the bottom of the tag. First I added the black ruler tape, then the smallest diamond tape above and below it. Fold excess tape to the back of the tag. Using Picket Fence Distress Paint, I lightly tap paint onto the Mixed Media Chickenwire Stamp. Stamp in several areas and immediately clean the paint from your stamp. I removed the top of the Distress Paint Dabber Broken China, and dipped the eraser end of a pencil into the paint to add some dots here and there. I add paint each time I paint a dot. When the paint is dry, add white pen marks to the blue dots. I stamped the script from Apothecary with Jet Black Archival Ink in several areas, and the large stamp from Fabulous Flourishes using Coffee Archival Ink along the sides. At this point I decided to go with the tag that had the best blue dots and the largest amount of Mustard Seed showing. I layered it onto black chipboard about 1/8” larger than the tag. I used a piece of Crinkle Ribbon and added direct from the pad 3 colors of Distress Ink, Peacock Feathers, Mustard Seed and Ripe Persimmon. I stamped the small Alphabet Stamp with Archival Ink. Then I very lightly spritzed it with water, crumpled it, and dried with the heat tool. The Ephemera layer consists of 1 Mechanical Flower Shape and a Medium Flower (metal) from Finnabair. The 3 Large Roman Numerals are from Anna, too. I topped it off with a Prima Lady Bird Paper Flower. Punch a hole in the black chipboard and add the ribbon to the top and a pearl to the center of the flower colored with Stream Alcohol Ink. The last thing I did was add white pen marks around the tag on the black chipboard. Check out the links to the Inspiration Emporium and get some great products!